Our little Ava is rather sick right now. She was diagnosed yesterday with para-influenza, a bug that can make a healthy baby sick, let alone a baby who is in heart failure like Ava. She is on oxygen right now and they’ve started her IV heart medication again and is being followed by the critical care team right now. We will just have to wait and see whether she has the strength to beat this bug, or if she will get worse which could potentially put her little life in jeopardy. Jason and I are just praying for peace and strength and that God’s will will be done in Ava’s life. Please pray for this little life, she is God’s and we are trusting in Him completely. 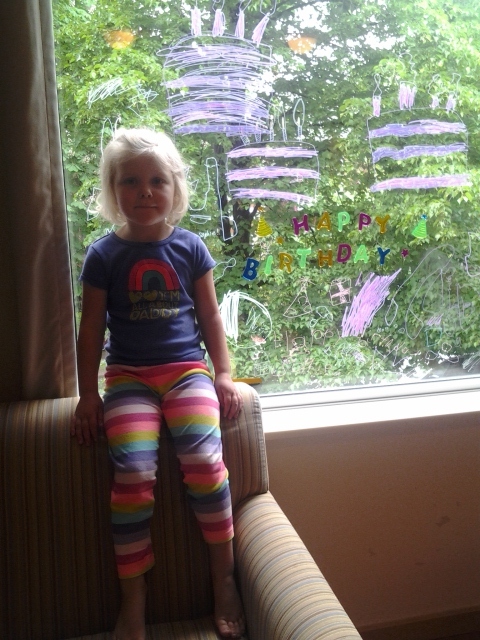 Sophia turns 4 today, Happy birthday Sophia!!! Last year when I expecting, she had to transition from my ‘baby’ to my ‘little one’, but now I think that we have to transition again to just our little girl. Oh Sophia, we love you! And talking about transitioning, we’ve all settled in well here at the Ronald MacDonald House. Although I was a little disappointed yesterday when I found out that Ava would be moving back into her own room at Sick Kids, and out of step-down where a nurse was always in the room with her. She does’t need that level of care now that’s not on the IV heart meds, but it was really nice to know that she was never alone,and so I didn’t feel guilty when I came back to the RM house to spend time with the family. Now I will start sleeping at the hospital again so Ava won’t be alone which is OK, it’s just another change. And since Ava typically does sleep through the night, if she has had a good day and settles well, I will come here and sleep at the RM house occasionally. And it’s a good thing Jason and I weren’t asleep last night at 10:15 when the fire alarm went off here at the house. Even though the alarm is VERY loud, we had to wake all the kids up and take them outside until we got the all clear (someone had probably just burnt popcorn) and so that was a bit of an adventure. And miss Ava is doing well… but probably not 100% percent. She is coughing more again and so today will get her third chest x-ray since we arrived on May 10th and will get yet another nasal swab to rule out any new infection. I hope it’s not anything new; but if it’s not viral, that means the cough is probably related to her poor heart function and that is not good either. Today we had our first introduction meeting with the transplant team, so as of tomorrow Ava will get some blood-work and tests to start the process of listing her. This really seems surreal, and it also means a complete change of care, from the dr’s and nurse practioners that we’ve grown to know and trust, to a completely new team, but again thankfully we’ll just do this one step at a time and I’m sure this new team is just as wonderful. Well I must go to spend the rest of the day with my family and our little birthday girl. Praise God our family is together again! 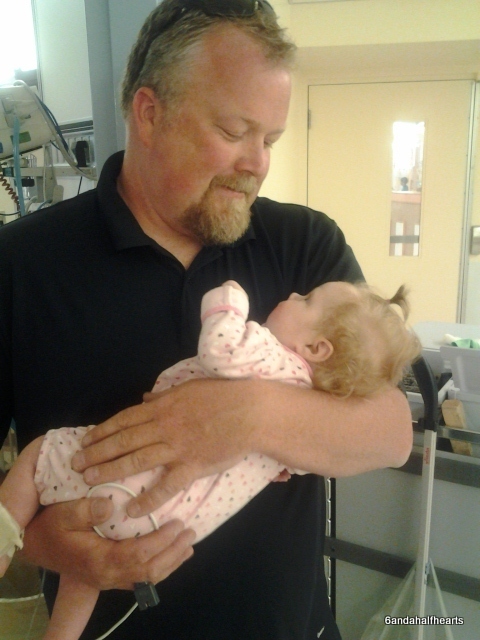 I went and saw Ava in the hospital Saturday morning and then hopped on a train around noon and was home before 3 pm. It was fantastic to be home, but bitter-sweet too because a part of me just didn’t want to leave, and was just wishing that we were all home together – with Ava – to stay. Oh blessed assurance. God has not forgotten us, and we knew then why God had been calling us to church, He wanted to encourage us, remind us that we can’t walk this journey on our own, and to keep walking in faith – even when things don’t make sense and we don’t understand. And like Norm said, God is still good even when everything that is happening seems not good. Praise God that He is good. 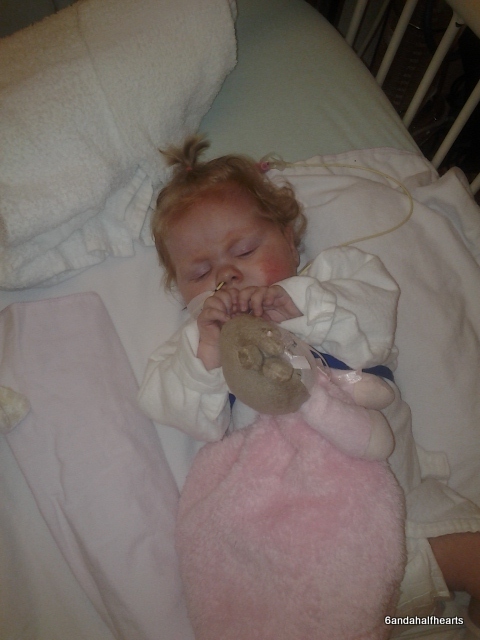 And one example of how good God is… poor little Ava has an IV, and that’s how she’s been getting her heart meds. But IV’s don’t last long on a baby like Ava who doesn’t have good veins – and last night it was in her foot, but when I came in this morning it had been changed to her hand; and I knew instinctively that it was hurting her. She was unhappy and unsettled and I know Ava and I knew that she was in pain. The nurse looked at it and thought that it was a good line, but blood kept backing up into it and thankfully our nurse practioner told the nurse to get the IV team back up to look at it. They came, and thought it was a good line, but as they were checking it, I was at the foot of Ava’s bed praying that God would be gracious and make it clear to them what the problem was. And then when they removing the bandages to get a better look… oops, the IV came out!! Praise God! 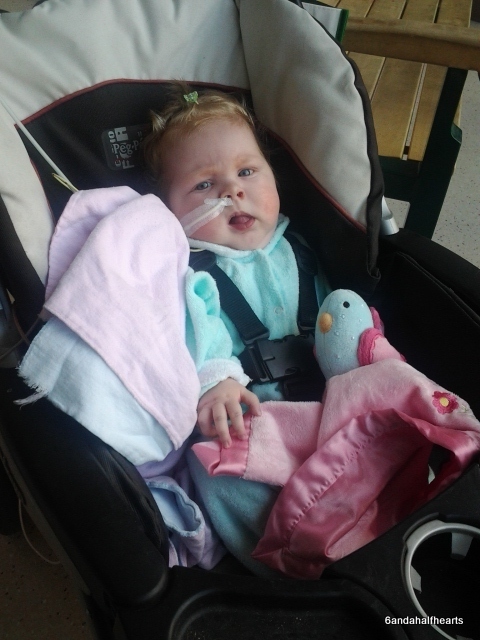 And before they could put another in, the NP and the cardiologist made a quick decision to take Ava off the IV heart meds, and try oral one’s instead – so that means no more IV’s, at least for now. So today was a good day without any new developments. Jason and the kids came up and got to see Ava again, and even though Ava wasn’t feeling her best today, it was so nice to see the kids excited to see their sister again and Jason and I are just so happy that our family can be together again. So we are hoping tomorrow is the day of the ‘Big Reveal’… where we hear about what the plan is for Ava. Will they consider doing surgery to fix her leaky tricuspid valve, so that we can hopefully get her Glenn? Or will we just continue to wait and repeat the cath in a few weeks. Or are there options we haven’t even considered. We shall see. And this morning when rounds came by I found out they found blood in Ava’s urine again last night, so they have started her on antibiotics, and tomorrow she will get an ultra-sound of her kidneys to make sure the poor baby doesn’t have kidney stones. Apparently one of the draw-backs to being on diuretics for long periods of time – in Ava’s case, her entire life – is that it makes you prone to kidney stones. Oh man, I hope she just has a bladder infection! But other than that, we had a good day. Ava was happy except her teeth – or lack of – were bothering her and she didn’t nap that great, but I still enjoyed being with her today. So please pray that tomorrow we actually hear some good news for a change and the ‘Big Reveal’ won’t be a big disappointment. Oh – and thank you for praying for Bella! She is so much better today – she spiked a fever last night but was started on antibiotics and is doing better. I was able to share with her mom that everyone had prayed for her and that was awesome. And thank-you all as well for your prayers and comments and emails… they are so encouraging, you have no idea.